The 12 days of the Minnesota State Fair mark summer’s last hurrah in Minnesota. That’s particularly true for Minnesota State Fair favorites like summer flowers, plants, crops, since summer generally starts to become fall during the fair. I have a vague sense that once upon a time, before the farm crises of the 1980s, the fair was the highlight of the summer growing season. It was the place where everyone brought the biggest and best from their fields and gardens. And, as such, the Agriculture Horticulture Building over-flowed with field corn, grains, vegetables, and flowers of all kinds as farmers and gardeners showed off the results of a summer’s hard work. Maybe that’s really how it once was, or maybe it’s just a Norman Rockwell fantasy. Whatever the case, there aren’t nearly as many displays of agricultural crops and garden produce at the Minnesota State Fair as one might expect. But they are still there. In addition, there are competitions for flowers and floral displays, fruit and wine, bees and honey, Christmas trees, and home brewing. Times change and so does the fair. While the number of participants in all of the plant and flower shows has declined over the years, these are still some of my favorite things to see at the fair. Various plant and garden societies hold competitions in two sections of the octagonal Agriculture Horticulture Building. All of the shows are staffed by volunteers who can answer questions and provide advice on growing your own plants. Most also give demonstrations of various techniques for growing whatever kind of plant is on display. 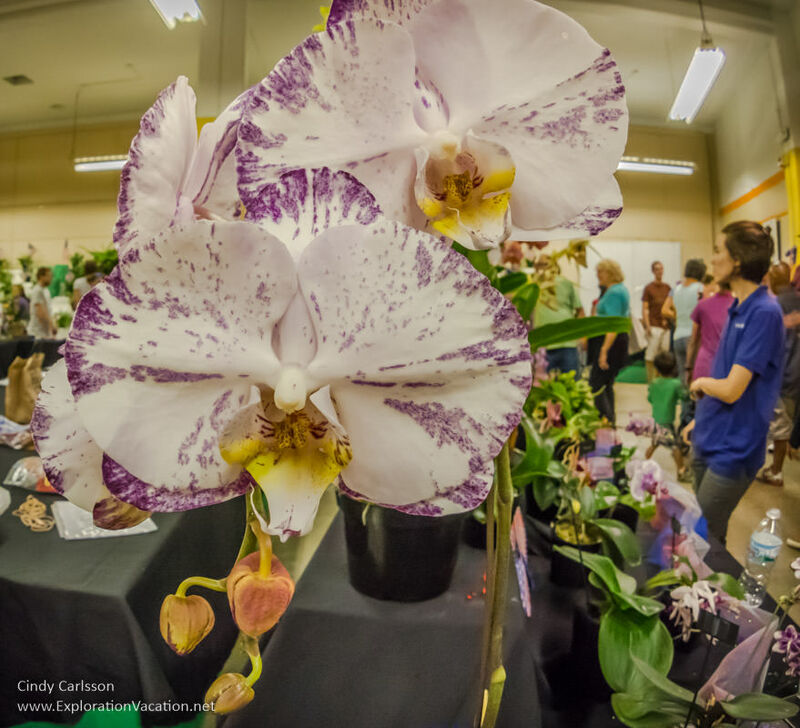 The competitions held by the orchid and bonsai societies are my favorites. And, conveniently for me, they are usually held at the same time. I used to grow orchids back in the days when I worked in an office with miles of window sill and other people around to water them when I was on the road. I was a member of the orchid society then too, so I even showed orchids at the fair a couple of years and worked as a volunteer. Working there was awesome, because it gave me plenty of time to check out every single plant! If I were a person with time and patience who didn’t travel very much, I’d not only have a room full of orchids, but a collection of bonsai as well. I dream of growing miniature pine groves and orchards and individual specimens that burst into bloom just like their full-size relatives. But I’m not that kind of person. Thankfully, I can always get a fix at the fair. Unfortunately, orchids and bonsai are only on view for a couple of days during the busy Labor Day weekend. That’s my least favorite time to visit the fair. I guess this is only the second year they’ve had these at the fair, but I went back to them so many times last year that it seems like they’ve been around longer! Created by Wisconsin artist Robert C. Anderson, these kaleidoscopes have large spinning bowls that are planted with flowers and other plants. The frame that supports each garden bowl also has a set of viewing tubes that can be turned to create different patterns like any other kaleidoscope. But you add color by spinning the garden. It’s totally cool and I absolutely want one for myself. But, since I can’t have one (they are both large and expensive), the set at the fair is the next best thing. 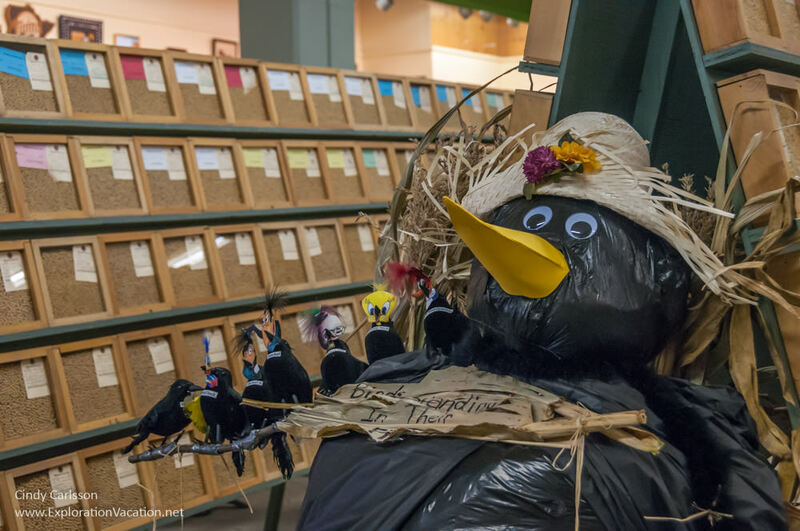 There are two rooms of plant and flower competitions in the Ag Hort Building, so there is always something to see. 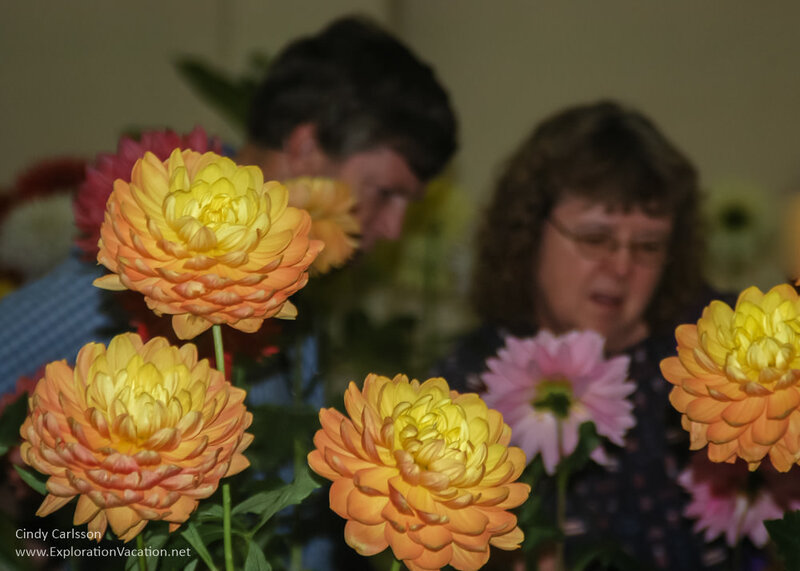 The Minnesota Horticulture Society and the state garden club hold shows there. So do the African violet, dahlia, and gladiola societies. 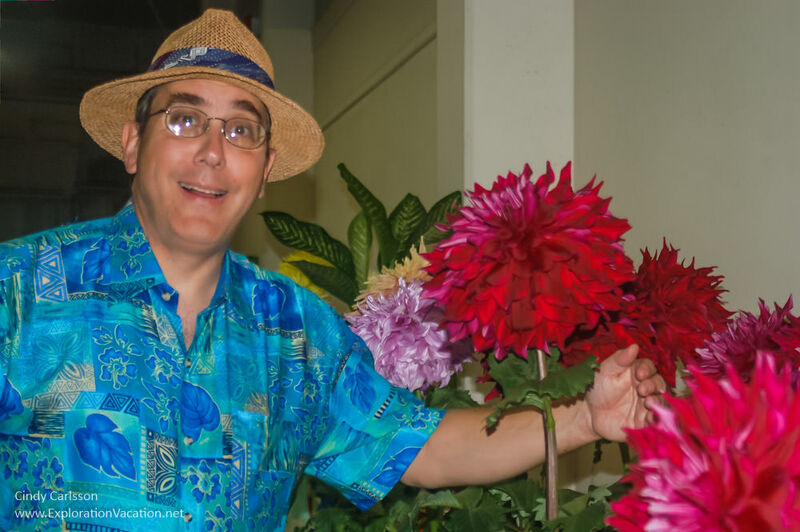 The state florists also hold a competition where they fill the rotunda of the Ag Hort Building with over-sized and over-the-top floral displays. The displays used to be traditional garden scenes, but recently each year’s displays seem more amazing than the last. One year there were lots of giant floral or floral-embellished critters. Last year there were orchids everywhere. This year there are garden party settings that include giant floral tables. At this rate, the florist association’s show could end up on my favorites list. If you’ve never been to the Minnesota State Fair or haven’t been there in a while, you might be surprised to see how well-landscaped the grounds are. This is no dusty county fairground! The state fair staff grows annuals in their own greenhouses (including 9,000 of the fair’s signature canna lilies) and the grounds are always planted with a variety of colorful flowers. In addition, a number of schools, nonprofit organizations, and businesses maintain little gardens around the fairgrounds. The majority of these are located around the Ag Hort Building. However, there are some scattered throughout the grounds. There are enough of them that you used to be able to get a map showing where they all are and create your own little tour. Surprisingly, displays for crops and produce are almost non-existent in the State Fair’s Agriculture Horticulture Buildings. (Assuming you classify crop art as art, rather than crops.) 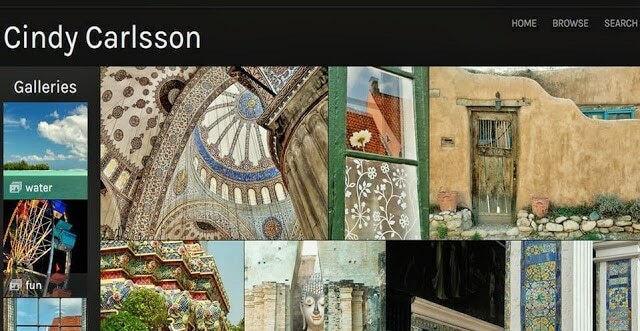 There are competitions, but either there aren’t a lot of entrants, or they don’t display all the entries, or I am just never around when they are on display. But crops aren’t all that interesting to look at anyway once you know how to tell the difference between all the grains and a few types of corn. More interesting (to me, anyway) are the decorated Christmas trees, scarecrows, giant pumpkins, and decorative squash. Of course, those aren’t really plants or crops, even if they are displayed with the crops. If you really want to know more about either field crops or vegetables, head for the towering 4H Building. 4H exhibitors are required to provide information about whatever it is they are exhibiting. Thus, 4H displays will include information about the individual crop or vegetable and how it is grown. And sometimes lots more too. By the way, if it’s crop art you are after, that’s coming in a future post about art at the State Fair.